Arshed Masih's funeral was held today amid tight security. The silence of the Pakistani media and government on the matter. AsiaNews sources denounce the attempt at misdirection and reveal the last words of the victim: "The police set me on fire" following the instructions of the Muslim employer. In the past his wife repeatedly raped by officers. Rawalpindi (AsiaNews) - the funeral of Arshed Masih, a 38 year-old Pakistani Christian, burned alive because he refused to convert to Islam was held today in Rawalpindi, under tight security. Hundreds of people attended the funeral, including members of civil society and NGO representatives. So far the police have arrested none of the alleged perpetrators and neither have steps been taken by the Federal Government or Ministry of minority groups. Meanwhile, more details have emerged on the crime: a well-informed source has told AsiaNews that police officers were the ones to set fire to the man, on the "instructions" of Arshed Masih. The 38 year-old Pakistani Christian, married and father of three children, aged7 to 12, died on 22 March following the serious injuries sustained during the assault. 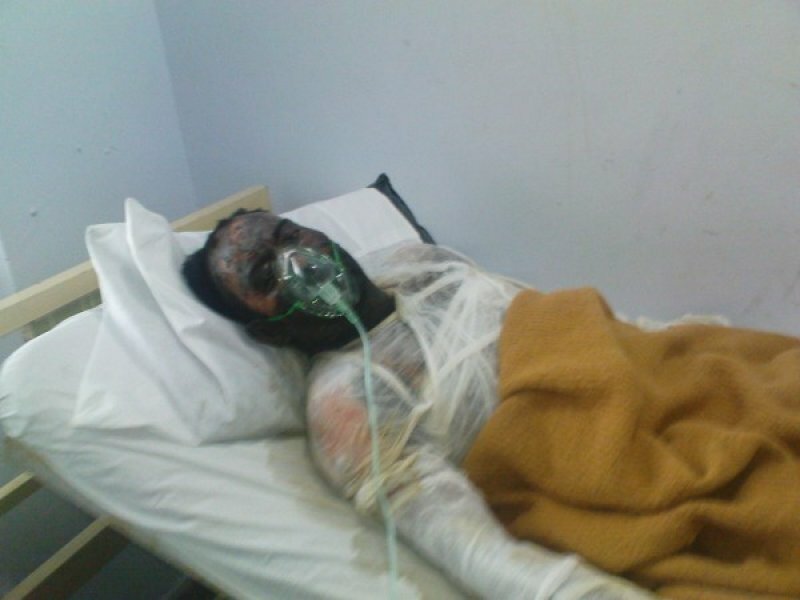 He suffered burns on 80% of his body excluding any possibility of salvation. The violence of his assailants was sparked by the man’s refusal to convert to Islam. Peter Jacob, executive secretary of the Justice and Peace of the Catholic Church of Pakistan (NCJP), confirmed to AsiaNews, his "strongest condemnation of this act brutal" and underlined that "a team has reached Rawalpindi and launched a parallel investigation into the facts”. He adds that "soon will we release a report, after proper verification of all elements”. The activist denounces, with regret, the silence of the Pakistani media about the incident and the lack of initiatives from the federal government and the Ministry of minority groups. Meanwhile, rumours have begun circulating that Arshed Masih set fire to himself to protest against repeated violence and torture of his wife Martha Arshed, by police. The abuse allegedly took place in the police station, where the woman was summoned several times by officers after a complaint of theft by Sheikh Mohammad Sultan, the employer of the Christian couple. In the house of wealthy Muslim businessman cash for a value of 500 thousand rupees (about 6 thousand dollars) has disappeared. Christian sources for AsiaNews in Pakistan deny this version, noting that some "elements" are casting doubt on the sexual violence and overturning the facts "to exonerate the employer and the police." An eyewitness, present in the hospital when Arshed Masih - still conscious - recounted the events to the investigators, says that "it was the police to set fire" to the man. The victim also added that "the police carried out the instructions of Sheikh Mohammad Sultan, at the scene along with other extremists." Since 2005 Arshed Masih and his wife had worked and lived on the estate of the late Sheikh Mohammad Sultan. The pressure on them to renounce Christianity had lately become incessant. The owner had come so far as to threaten "dire consequences", to persuade them to embrace Islam. The couple were also accused of a recent theft by the owner who has promised to drop the complaint for their conversion. BosNewsLife.com reports that the Muslim businessman has declined to comment on the crime. However some eyewitnesses have seen him near the place where the accident occurred, but it is unclear whether he actively participated in the attack. Their children - adds the site - are sleeping in the hospital because they are homeless. The mother is still in shock and is unable to speak.